I miss classic articles like “Hints from Heloise”. Looks like TV is bringing back old 80’s shows. Does this mean that Newspapers and TV are losing their following and having to revert to what worked in the past? 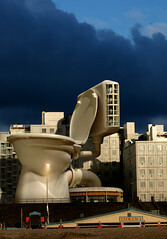 The toilet picture is a joke and as you said nothing more than a poor marketing tactic. It seems that most news reporting agencies have turned the majority of their focus over to digital media, so why even continue the printed editions? With the advancements in personal technology, who actually sits and reads the paper every morning like we used to, I sure don’t. I quit paying for the paper when I discovered that I could get the same news for free. I agree with Terri, this was indeed a very poor marketing tactic and in reality nothing more than a joke. I also quit paying for the paper. I can get twice as much news, whenever I want it online. Great post, by the way. Keep up the good work.